Crazy just might be an understatement. Mai’s dreamy young-love anthem has spent the past 12 straight weeks lighting up the YouTube U.S. Top Songs chart, beating out the likes of Drake, Post Malone and Maroon 5 for the #1 slot for the last 3 weeks. YouTube highlighted Ella Mai as an “Artist on the Rise” in 2017, featuring her on YouTube’s trending tab and helping propel the song forward. 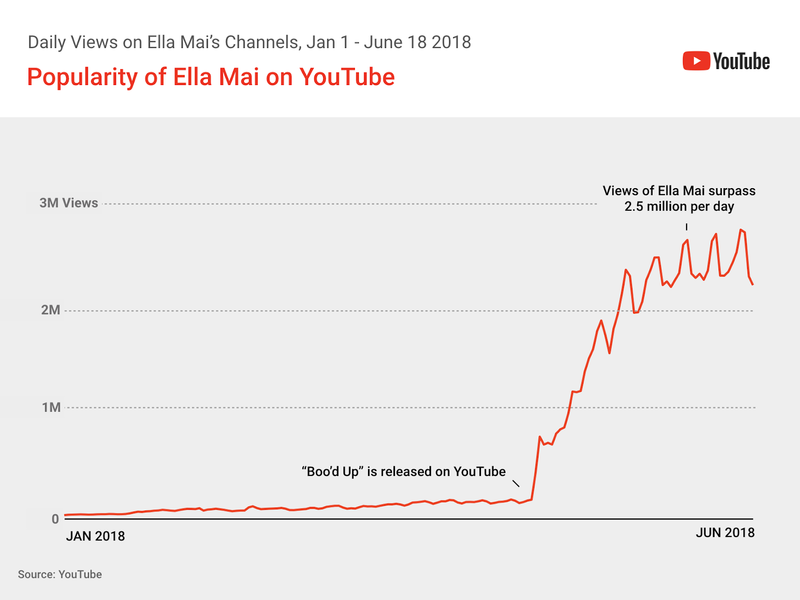 The success of “Boo’d Up” also marked her return to the trending tab in 2018. Across YouTube, Mai is earning as many as 3 million views a day, a 2,600 percent increase from her average at the start of 2018. The views have made her one of the current top 15 most-streamed artists in the U.S. and have also earned Mai a slot in YouTube’s Artist on the Rise program. It’s been quite the journey to stardom for the 24-year-old singer. Born in London and named after the legendary jazz artist Ella Fitzgerald, Mai split time between London and New York as a child, drawing musical inspiration from both sides of the Atlantic. She signed with DJ Mustard after the legendary producer and hitmaker caught clips of her doing something we all do — singing along passionately to soul and R&B songs. “He reached out and asked me my situation, and I didn’t have one,” Ella Mai laughs. “I was literally just singing alone in my bedroom.” The encounter eventually led to a deal with Mustard’s Interscope-backed 10 Summers label, and stylish clips for singles like 2016’ “She Don’t,” "10,000 Hours" and “Lay Up” followed. By March the song had crept into the YouTube Top Songs chart in the U.S. and by April had landed a slot in the Billboard Hot 100. "That’s when I realized, wow, this is something. This is bigger than I ever expected,” Ella explains, “and my team and I were like, we need to shoot a video." The clip proved to be the spark the track needed, vaulting the song further and further up the YouTube charts before landing at its current #1 slot earlier this month. But for Mai, the success is all part of the journey. “I don’t really spend my days thinking about the charts, or if my music is on there or not. I never really base my success on that,” she explains. "I just put out music I love, and if people love it too, that's great." That love and humility is evident throughout Mai’s intimate tour diaries, candid interviews, powerful live performance and emotional music videos — and even her response to her YouTube Artist on the Rise nod.